While my classmates were buying oxen and dying of dysentery, I was off on a very different sort of adventure. 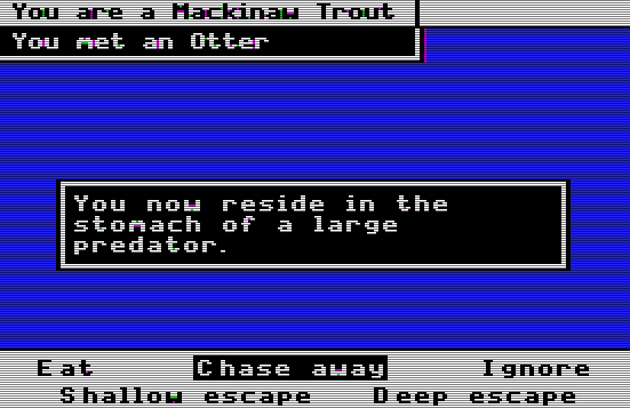 I eschewed the concept of manifest destiny, and chose to live life as a fish in Odell Lake. Odell Lake didn’t teach you as much as it forced you to learn if you wanted to live. The game was a brutal survival sim, and if you couldn’t master predator-prey relations, you’d be lucky to last five minutes. While Oregon Trail could be fairly complex, Odell Lake was extremely simple. You could choose a fish and explore the water, or play for points and have your fish type chosen at random. As you progressed, fish, plants, and other creatures would appear on your screen. You had to select your course of action before the timer ran out, and hope to god it was the right one. Odell Lake‘s limitations made it challenging in ways it was never intended to be. I knew not to be afraid of algae, but when I saw a moving blob of slime on my screen, my first instinct was to run away. I knew an osprey could kill me, but I didn’t know the bizarre screeching sound blaring from my headphones was supposed to signify its presence. At times, Odell Lake felt almost like a horror game. Death was sudden and incredibly startling, and the lack of music made it pretty unnerving. The abrupt sound effects scared me out of my seat more than once, and the algae creeps me out to this day. 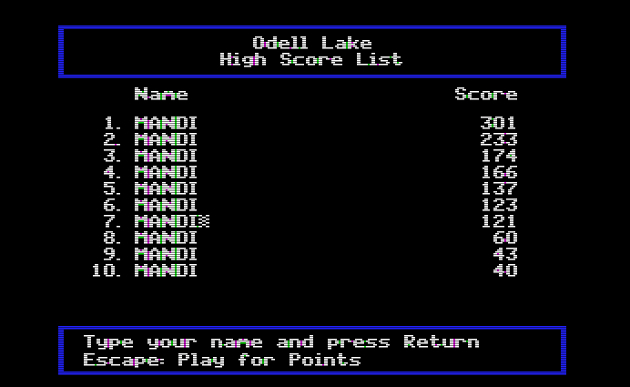 I never managed to convince my classmates that Odell Lake was worth playing. I wasn’t a particularly articulate kid, and my descriptions didn’t do much to sell the game’s spookier aspects. “It’s cool and it has fish” couldn’t compete with The Oregon Trail‘s customizable tombstones. 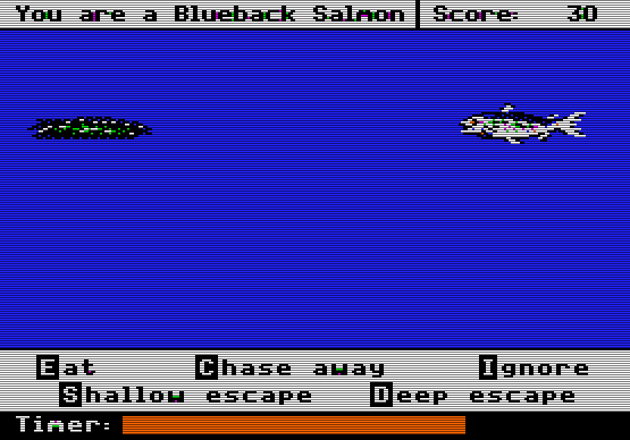 But I’m pretty sure I learned more from Odell Lake than they ever did from Oregon Trail. I can tell you all sorts of things about the diets of freshwater fish. How much do you actually know about migration routes in the 19th century? Don’t get me wrong; I have plenty of affection for The Oregon Trail. Still, nothing can compete with the fear-inspired teachings of Odell Lake.